NOTE: Contains spoilers through s4/ep03 "Indifference". Hey Walking Dead TV series, I'm going to cut to the chase...I just don't think I can watch you any more. It's not me, it's you. Somewhere along the way you've changed and aren't the premise I love any more. I gave you some warning that things were on shaky ground, so in all honesty this shouldn't come as a surprise. I just don't think we are connecting. I don't understand your motivations, or the story you are trying to tell me. When it comes down to it, I've started to realize I just don't care. Even before watching my final episode, "Indifference" (seriously, could that title be more perfect? ), I could feel my interest waning. This episode sat on the DVR for about two weeks before I even thought to give it a watch. This is a sure sign I was avoiding your calls. Lately, you don't have anything interesting to say. Oh, Michonne is out traveling again? Daryl, also out? What's Tyrese's deal anyway? Do you just not want to tell me what's going on, or do you not know? Lately, the character who has been getting the most development is the Hyundai vehicle that is always clean, gassed up and ready for its close-up. I understand that an ensemble cast can be difficult to write for, but when the car has more personality than half your cast, I think it's time to make a visit to the writers' room. TV Series, the one bright spot in our relationship was Carol. 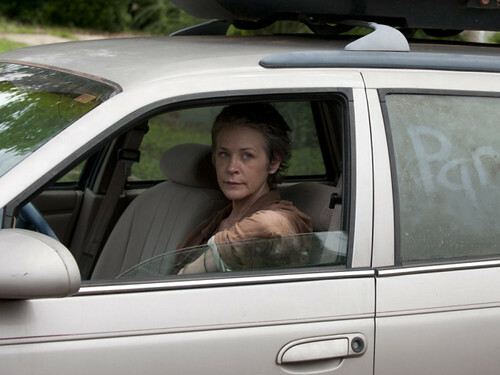 During "Indifference" you reminded me that before the Zombocalype, Carol was a survivor, a victim of domestic violence. She came with coping mechanisms, and survival tactics that she tried to share and teach to the kids in the settlement. More than any other character Carol has adapted, and that makes her interesting. Meanwhile Rick continues to stick his head in the sand, almost literally as he spends all his time being Farmer Rick, letting others take on some of the more nasty chores of day-to-day zombie life and plague management. At least his head is in the sand until he lifts it out to deliver some grade A double talk on why he's decided to kick Carol out of the group. When Carol drove off after Rick told her she shouldn't be making decisions for the group (Huh? Isn't that what you just did??? ), I decided I'm going with her. It might be a little awkward, but I'm going going to keep spending time with the comic and the Telltale Walking Dead game. They still make me feel something for the characters and the premise. The Telltale game follows a totally different group of survivors in that same post zombie apocalypse world. There is more character development in that 5 chapter game than in 4 seasons of the show. While it's true that in the game you can control some of the actions of the characters, they behave consistently and more naturally. In finishing the Telltale game, there were tears! So many tears! For all your emotional manipulation, TV Series, you could barely cause a watery eye...and I cried when I read this page in Matt Fraction's FF! PS- I read some spoilers about the most recent mid-season finale episode. Not regretting my decision one bit.